"Finally...a solution that is as stylish as it is practical. 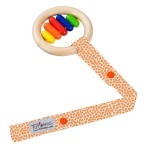 Keeps virtually any teething toys from hitting the ground when out on a walk and keeps them nearby when indoors". • No more lost or dirty toys. • Enables child to “rescue” their toy on their own. • Connect one end of the Toy Sitter to a stroller, car seat, carrier, shopping cart or high chair; connect the other end to a child’s favorite toy. • Use the center snap to shorten the strap’s overall length or to create a larger loop at one end. • Each Toy Sitter has been made with Safety as #1 priority, but as with any baby toy, please use only under adult supervision. • Handmade in the USA. A must have to look after your baby's toys when out and about.